Write the coordinates of the vertices of a rectangle, whose length and breadth are 6 units and 3 units respectively, one vertex at the origin, the longer side lies on the Y-axis and one of the vertices lies in the II quadrant. Also, find the area of the rectangle. Let us draw the coordinate axes XOX’and YOY’ and choose a suitable units of distance on the axes. Let 1cm = 1 unit. 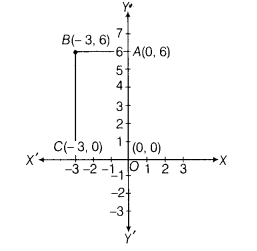 Mark a point A on Y-axis at a 6 units distance in positive direction of Y-axis and mark a point C on X-axis at a 3 units distance in negative direction of X-axis. Now, draw a perpendicular lines from C and A, which meets at a point B.